We’d love your help. Let us know what’s wrong with this preview of The Girl with Seven Names by Hyeonseo Lee. An extraordinary insight into life under one of the world’s most ruthless and secretive dictatorships – and the story of one woman’s terrifying struggle to avoid capture/repatriation and guide her family to freedom. As a child growing up in North Korea, Hyeonseo Lee was one of millions trapped by a secretive and brutal totalitarian regime. Her home on the border with China An extraordinary insight into life under one of the world’s most ruthless and secretive dictatorships – and the story of one woman’s terrifying struggle to avoid capture/repatriation and guide her family to freedom. To ask other readers questions about The Girl with Seven Names, please sign up. Would The Girl with Seven Names be a good choice for a high schooler? Lynn YES! I agree with the other answer. I've taught middle school. Definitely appropriate and and eye-opener. Good review Goodreads. But you write this? "Hyeonseo instead remained in China and rapidly learned Chinese in an effort to adapt and survive." Actually, in the Book, Hyeonseo says her Father made her learn Chinese (Mandarin) at age 6, and she thanks her Father for doing that, as she was so good at spoken and written Chinese that the Chinese Policemen who arrested her thought she REALLY was Chinese. Sophie I'm afraid you are mistaken. She began to learn Chinese characters at school at age 12 (Chapter 9). Her father encouraged her to learn calligraphy…moreI'm afraid you are mistaken. She began to learn Chinese characters at school at age 12 (Chapter 9). Her father encouraged her to learn calligraphy (Ch. 9), but she "had no spoken Mandarin at all" (Ch. 17). She learned it in China (Ch. 21). Thanks to everyone who voted in the 2015 #GoodreadsChoice Awards. Of course, I was hoping to win, but I'm still honored that I came in 4th place out of many good books. Wow!!! I never thought my memoir would make it to the FINAL round of the 2015 #GoodreadsChoice Award. Only ten books are left. Thank you so much to everyone who has read my book and supported me. Award for Best Thanks to everyone who voted in the 2015 ‪#‎GoodreadsChoice‬ Awards. Of course, I was hoping to win, but I'm still honored that I came in 4th place out of many good books. Wow!!! I never thought my memoir would make it to the FINAL round of the 2015 ‪#‎GoodreadsChoice‬ Award. Only ten books are left. Thank you so much to everyone who has read my book and supported me. Thank you to everyone who has voted or is planning to vote! In North Korea the only laws that truly matter, and for which extreme penalties are imposed if they are broken, touch on loyalty to the Kim dynasty. Hyeonseo Lee grew up as a loyal and happy citizen of North Korea - the greatest country on earth. Lee grew up believing that her leaders were gods - that they can be in two places at once, that stars appeared in the sky when they were born, that they (single-handedly) led their people to victory. Sure, food was a bit scarce and there was always the danger of informers, but westerners were starving in the streets and US soldiers used South Korean children as target practice. The older she grew, the more those beliefs began to crash around her. One of the tragedies of North Korea is that everyone wears a mask, which they let slip at their peril. Thanks to her mother's smuggling business, Lee was exposed to Chinese goods, fashion and Korean music. All these things were deeply puzzling - if North Korea was the greatest, then how could these other countries produce such things. Kindness toward strangers is rare in North Korea. There is risk in helping others. The irony was that by forcing us to be good citizens, the state made accusers and informers of us all. When she turned seventeen, Lee decides that she will cross over to China - just once - to see what it was like...only for her brief trip to turn into a decade-long journey. She could never return but with rumors circling that her family is in jeopardy, Lee knows that she will have to go back...and get everyone she can out. This is when I understood that we can do without almost anything – our home, even our country. But we will never do without other people, and we will never do without family. I am absolutely blown away - and completely disgusted - with the way North Korea is. Reading about her struggles and what she overcame was riveting. I just can't get over how terrible her life was and the emotional upheaval she went through to get out. It is one thing to read the bland newspaper headlines or news hosts reading off their prompts and it is completely a different thing to read a personal struggle. Her writing was unapologetically honest and portrayed a heartfelt depiction of her personal battles. Lee's life was truly amazing - I cannot do it justice. Read by Josie Dunn - who gave it just the right tone and inflection. Beautifully read. Full Disclosure: I am a South Korean and I have encountered with a number of readings, TED-talks, Youtube videos on life in North Korea, testimonies of North Korean defectors on horrific lives in our neighbor country. However, I found this book intriguing, unique and inspiring. What Hyeonseo offers in this book is quite different from other N.Korean defector's story. She's from a family with high class, had a relatively comfortable life to North Korean standard, and did not leave her country and Full Disclosure: I am a South Korean and I have encountered with a number of readings, TED-talks, Youtube videos on life in North Korea, testimonies of North Korean defectors on horrific lives in our neighbor country. However, I found this book intriguing, unique and inspiring. What Hyeonseo offers in this book is quite different from other N.Korean defector's story. She's from a family with high class, had a relatively comfortable life to North Korean standard, and did not leave her country and family with the intention of never going back and in search for freedom. It is the realities of the ruthless, harsh regime that twists her path back to her country and she is thrown into a new universe where she had to make her own way. With more candor than emotion, she tells how she found the new world with freedom was also a world full of challenges and hardships, and how she navigated them to find her way through and found her identity as herself. This book is also unique in a way it tells N. Koreans life in free countries can be challenging and not as rosy as many may simply imagine. How profound the propaganda is engraved in people's mind and perspectives, now the capitalistic life can be menacing, and how the sudden exposure to this unknown terrain could be as dangerous as to most defectors. All important topics and questions that deserve more attention among people in South Korea as host nations and be discussed to find better answers. By the time she turned 29, Hyeonseo Lee had spent a decade living on the run and in hiding. She had escaped a brothel, survived a kidnapping, run away from a loveless engagement, and changed her name four times. She was attacked on the street, robbed, conned, and arrested more than once. Hyeonseo Lee was born in North Korea under a different name, to a family with good songbun (NK's caste system). But even being one of the lucky ones in North Korea means that Lee witn By the time she turned 29, Hyeonseo Lee had spent a decade living on the run and in hiding. She had escaped a brothel, survived a kidnapping, run away from a loveless engagement, and changed her name four times. She was attacked on the street, robbed, conned, and arrested more than once. Hyeonseo Lee was born in North Korea under a different name, to a family with good songbun (NK's caste system). But even being one of the lucky ones in North Korea means that Lee witnessed her first public execution at seven years old. Like all citizens, starting in elementary school, she was forced to partake in weekly tattletale sessions, where one has to confess to a "crime" or accuse someone else of one. It could be as simple (and deadly serious) as "I don't think about the Dear Leader enough times during the day." While her family had food, in part because of her industrious and savvy mother, she witnessed others starving to death during the 1990s famine that killed hundreds of thousands. Even under these conditions, when Lee escapes, it's purely a matter of curiosity. Her family lives in a town directly across from China, along the narrowest part of the river that separates the two countries. She plans to turn around and come right back, but things don't work out that way. But it's not freedom that necessarily waits for her beyond the border. The Chinese government is dogged about tracking down illegal North Koreans and returning them to their fate back home. In many ways, Lee's life in China is as arduous as her life in North Korea. South Korea gives citizenship for all NK asylum seekers, but getting there isn't easy. Lee finally makes it and without suffering abuse in a Laotian prison like so many others-- women, particularly-- desperately trying to get to Seoul. Yup, Hyeonseo Lee is one of the "lucky ones." And I've never felt so damn privileged in my life. What an interesting story and its so hard to believe that in this day and age that a whole nation of 25.5 Million people could be so cut off from the rest of the world and its leader could controll and dictate everything about peoples lives from birth to death. I had read a couple of books on North Korea over the years and came across The Girl with Seven Names: A North Korean Defector’s Story and another book which I felt were both worth reading. This book is easy to read and Hyeonseo Lee is certa What an interesting story and its so hard to believe that in this day and age that a whole nation of 25.5 Million people could be so cut off from the rest of the world and its leader could controll and dictate everything about peoples lives from birth to death. This book is easy to read and Hyeonseo Lee is certainly a lady with a lot of courage and if you enjoy reading about different culture and traditions then this is interesting and a great insight into one young woman's struggle to gain freedom. I watched a couple of you tube clips of this lady giving talks and she certainly is an inspiring and interesting woman and her book is an excellent insight into life under one of the world's most ruthless and secretive dictatorships. There were times in the story where I struggled with the authors choices and found myself wondering why she made some of the crazy choices she did and yet the more I though about it the more I realised she wasn't brought up as I was where making choices is something I take for granted, in her world life is dictated to you and you dont get to crave your own path in life so therefore choices and decisions must be very difficult to make when its never been part of your life. Each chapter ends in a sort of cliff hanger which I found a little bit pointless as the book didn't need to be written in this format as the story is so compelling in itself but its only a small thing and doesnt take a way from the book. The one thing this book really brought to light is just how confusing and challenging life in the free world can be for those who make the journey and the guilt and worry over family left behind. I did enjoy this but I also feel like she made a lot of really incredibly dumb choices that really made no sense. For example she stayed with relatives in China for 2 whole years (!!!) and didn't think of maybe using that time to get a job to save money, or to learn a vocation? Then she runs away penniless on the spur of the moment and has no plan of what to do. You had 2 years to think about it and relied on the kindness of distant relatives to support you, but you didn't think ahead of what to I did enjoy this but I also feel like she made a lot of really incredibly dumb choices that really made no sense. For example she stayed with relatives in China for 2 whole years (!!!) and didn't think of maybe using that time to get a job to save money, or to learn a vocation? Then she runs away penniless on the spur of the moment and has no plan of what to do. You had 2 years to think about it and relied on the kindness of distant relatives to support you, but you didn't think ahead of what to do next?? She seemed really naive in general, especially when she constantly turned to brokers for help, even though she clearly says again and again she didn't trust them. She was incredibly lucky and fortunate to have people around her who had a lot of money to constantly bail her out and those connections clearly helped her. Also the fact that she didn't even know at first that people were starving in the 90s in N. Korea and she was eating meat daily, makes it clear that she lived a very insulated life there, and probably had a very different experience from the average N. Korean. I'd really love to know her mother's story, because to be honest, she sounds like a much tougher cookie than her daughter, cleverly supporting her 2 children and getting them through famine as a single mother. Wow, hats off to her! I did enjoy this book because I'm fascinated with any books from N. Korean defectors in general, but my sympathies with her were limited. I'm glad she got out, and that she was able to help her family as well, but this is probably not the experience of most N. Korean defectors. I do wish her all the best and hope more people learn about what is going on in N. Korea. She’d had no idea where Shenyang was—that I actually coul I listened to this remarkable story, read by Josie Dunn and published by HarperCollins Publishers UK, with a degree of disbelief. Certain parts of the story agree with what I’d learned already about the lives of North Koreans, the general trend of their escapes, and their orientation in South Korea as refugees. The author was young, seventeen, when she decided to cross the frozen Yalu in winter and go see her relatives in Shenyang, China. Her own path to freedom was relatively smooth; she’d learned to be wary of revealing much about herself from childhood and was not easily deceived. Being young and attractive gave her the benefit of the doubt in China, and she wasn’t able to escape every attempt to corral her into exploitative jobs. But she lived on her wits and managed, eventually, to eventually pass as Chinese-Korean. With this identity she was able to procure a passport (and a new name). She lived in China ten years. I don’t want to spoil the adventure for those who aren’t familiar with her story, but it is a doozy. Her family in North Korea had a good songbun (status or name) which they exploited to bring goods in from outside the country. An uncle actually sold heroin. Her mother brought in all manner of household goods and occasionally even methamphetamines! Hyeonseo’s brother began doing much the same illicit and illegal trade work, bribing border guards, etc. after Hyeonseo left. Apparently her departure was officially overlooked, perhaps as the result of a bribe. The story rings true, and she’s told it so many times by now that there are all kinds of suggestive chapter endings which propel one to turn to the next chapter. Apparently Ms. Lee met with President Trump with some other defectors in the White House in January 2018 before the president’s departure to Singapore to meet Kim Jong Un. She has given many talks around the world about her experience and that of her family, including a TED talk I have linked to on my blog. This was definitely the best autobiography I've read to date. Hyeonseo is a brave exceptional woman who has been through hell and back. The loyalty and love she has for her family was so lovely to read. I can't even form a proper review- no review will describe how much I loved reading this book! "...in truth there is no dividing line between cruel leaders and oppressed citizens. The Kims rule by making everyone complicit in a brutal system, implicating all, from the highest to the lowest, blurring morals so that no one is blameless........Ordinary people are made persecutors, denouncers, thieves. They use the fear flowing from the top to win some advantage, or to survive." At the age of 17 Hyeonseo escaped North Korea but her battle did not end there. It was not until she finally managed the defect to South Korea almost ten years later than she was able to experience anything remotely like freedom, and even then she was not willing to relax until she had also assisted her mother and brother to freedom. Theirs was a completely foreign world to mine and I cannot begin to imagine experiencing all they endured. Time and again Hyeonseo Lee and her family put their lives at risk, were at the mercy of con men, brokers, corrupt police and other officials expecting to be bribed whether to turn a blind eye or to ease their paths to freedom. I am often bewildered about why the people of places like North Korea remain loyal to tyrannical governments and Hyonseo explained it this way "North Koreans who have never left don't think critically because they have no point of comparison - with previous governments, different policies, or with other societies in the outside world." This is the first time I read a North Korean defector's story.I had read about the oppressive regime but the book is an eye opener of all sorts.Though written like a thriller novel,the book tells a lot of suffering that the North Koreans go through in their perilous journey during their defection.The treatment of these defectors in China is a matter of concern for the international community. The book deserves 4 stars ...1 deduction for too much propaganda material in the beginning and sensationa This is the first time I read a North Korean defector's story.I had read about the oppressive regime but the book is an eye opener of all sorts.Though written like a thriller novel,the book tells a lot of suffering that the North Koreans go through in their perilous journey during their defection.The treatment of these defectors in China is a matter of concern for the international community. This is an amazing book. You may go into it knowing that it's written by a young lady who leaves North Korea in search of a better life, but in truth, it is so much more than that. Hyeonseo successfully made it out of North Korea and lived in China for 10 years illegally. The book speaks of her life in North Korea and you may be surprised that in many ways it is worse than what we hear on the news, but I guarantee you will be surprised at her continued love for her homeland and her longing at tim This is an amazing book. You may go into it knowing that it's written by a young lady who leaves North Korea in search of a better life, but in truth, it is so much more than that. Hyeonseo successfully made it out of North Korea and lived in China for 10 years illegally. The book speaks of her life in North Korea and you may be surprised that in many ways it is worse than what we hear on the news, but I guarantee you will be surprised at her continued love for her homeland and her longing at times to return. In China, she is in hiding as an illegal, but someone turns her name in. She survives the interrogation by convincing the authorities that she truly is Chinese and proves it by showing them her command of the Mandarin language and mastery of Chinese written characters. Thankfully, her father made sure she knew these things as a child. She also survives an assault that lands her in the hospital. Also while in China she barely escapes human traffickers and manages to avoid an arranged marriage to a worthless man. Eventually, she makes her way to South Korea where things finally become a bit easier and she begins the long process of attempting to get her parents out of North Korea. This book has been on my To-Read list for a long time. I was so excited when I finally got it from the library. I highly suggest this book to everyone. It is such an eye-opener and so fascinating. What North Koreans are going through to become free is so tragic. "An extraordinary insight into life under one of the world’s most ruthless and secretive dictatorships – and the story of one woman’s terrifying struggle to avoid capture/repatriation and guide her family to freedom. As a child growing up This book has been on my To-Read list for a long time. I was so excited when I finally got it from the library. I highly suggest this book to everyone. It is such an eye-opener and so fascinating. What North Koreans are going through to become free is so tragic. This review has been hidden because it contains spoilers. To view it, click here. 4.5 stars. One of the better books I've read on North Korean defection. Kudos to the co-author who brilliantly translated Lee's emotional journey into a page-turner. The third part was my favorite because it involved her family's long and arduous journey to join her in South Korea. I wasn't surprised that both her mother and brother longed to return to the North because adapting to life in Seoul presented a tremendous and negative cultural shock. While it is impossible for me to imagine what dai 4.5 stars. One of the better books I've read on North Korean defection. Kudos to the co-author who brilliantly translated Lee's emotional journey into a page-turner. The third part was my favorite because it involved her family's long and arduous journey to join her in South Korea. I wasn't surprised that both her mother and brother longed to return to the North because adapting to life in Seoul presented a tremendous and negative cultural shock. While it is impossible for me to imagine what daily life would be like in the North Korean regime, I can imagine that adapting to a polar opposite way of living in the day-to-day - full of unknowns and experiences so uncommon (such as using an ATM) - might make me wish to return to the the devil I knew. This is the second book that I have read, which tells the stories of North Korean defectors, the first being Nothing to Envy. I debated with myself whether I need another book for my book world trip, but what set my mind was the idea, that while Nothing to Envy is a story told through a "middle man", The Girl with Seven Names is an autobiography. Ultimately, now I can say that the difference between the two books is mostly in the wa Also available on the WondrousBooks blog. I debated with myself whether I need another book for my book world trip, but what set my mind was the idea, that while Nothing to Envy is a story told through a "middle man", The Girl with Seven Names is an autobiography. Ultimately, now I can say that the difference between the two books is mostly in the way they view the subject. Hyeonseo Lee tells her own experiences, the life as she knew it, the world as she was taught to view it. However, Barbara Demick's book is more of a collection of stories, told through the prism of someone who knows the political situation well and could define the difference between what the defectors were experiencing, and what they knew about the world, versus what was actually happening. While this is mentioned in Lee's narrative, she talks about it more in retrospect, as when certain political and historical situations were unfolding, she was oblivious to the facts, having been indoctrinated in the North Korean values. For me, The Girl with Seven Names was a very valuable and interesting look into North Korea, and especially the way the people there view the world. But more so, as Hyeonseo Lee says so herself, she was not even from the lower classes of society, so she had it better than the rest. And "better" was not starving to death, not being sold as a bride in China, not being invited to serve and please the "leader". "North Koreans have a gift for negativity towards others, the effect of a lifetime of compulsory criticism sessions." While to my knowledge, people haven't had those criticism sessions here, I feel like pessimism and negativity are only two of many things that get born from regimes like the one in North Korea. So in many ways, the book was both very alien and unimaginable, but also very familiar, and close to home. 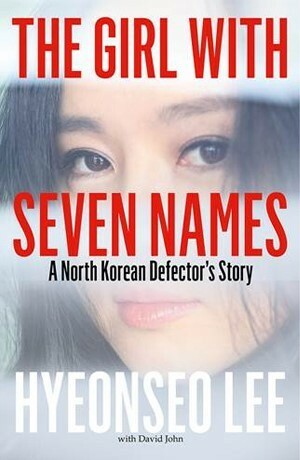 The fact which saddened my while reading both The Girl with Seven Names, and Nothing to Envy, is how North Koreans are treated while trying to defect. I would understand the unnecessary repercussions if North Koreans were not wanted in South Korea. But knowing that South Korea welcomes them, for all the countries around to stop the defectors, imprison them, or return them to North Korea to be punished or even executed, seems the highest level of inhumane. While reading this book, I couldn't stop thinking how lucky Hyeonseo Lee was in comparison to other defectors. At the very least, she managed to get out, and save her family, and even become a spokesperson about the rights of North Koreans. But what about all of those who were detained, killed, or maybe even worse...? What a fascinating look inside a place so shrouded in secrecy. I've watched a couple of documentaries about North Korea on Netflix, and was shocked by the extent of indoctrination and how isolated the North Korean people are from knowledge of the world beyond their borders. This is the story of a young girl who had it pretty good in North Korea, comparatively speaking [the ludicrousness of that statement is illustrated by the fate of her father], but was starting to have some doubts and question What a fascinating look inside a place so shrouded in secrecy. I've watched a couple of documentaries about North Korea on Netflix, and was shocked by the extent of indoctrination and how isolated the North Korean people are from knowledge of the world beyond their borders. This is the story of a young girl who had it pretty good in North Korea, comparatively speaking [the ludicrousness of that statement is illustrated by the fate of her father], but was starting to have some doubts and questions about the awesomeness of her homeland, and the supposed benevolence of its rulers. In an act of teenage rebellion and impetuousness, she decided to sneak across the border to China for a quick look around. Little did she know that she'd be leaving her family behind for many years, that she'd be placing them in grave danger, and that she, as a 17 year old girl with no money, would have to figure out how to deal with the consequences of her impulsive act and make it on her own from there on out. The beginning of the book describes life inside North Korea, and it's almost impossible for someone born in a free country to imagine a life like this. The thing is, if you were born of a higher social caste, like the author's family, life wasn't all that bad so long as you played the game, watched your every word, and didn't mind living under the constant threat of arrest and public execution. This book reads like fiction. It's filled with twists and turns and kept me on the figurative edge of my seat. Things were not totally peachy just by virtue of escape across the border. Illegals in China get shipped back to North Korea all the time, and the threat of detection is ever-present. Nor is it simple for a young North Korean with no papers to make a living. Hence the decision to make it across the border to South Korea and to formally defect. The route to do that, and the challenges and risks involved, were many. I alternated between thinking the author was incredibly brave, crazy, lucky, or some combination of all. She's determined to see her family again, and she makes that happen. The story of how is gripping. This is the third book that I’ve read about North Korea. My favorite is still Nothing to Envy by Barbara Demick, and one that I highly recommend. “The Girl with Seven Names” is a close second. I could barely put this book down. It’s beautifully written, so moving, the type of book that you can’t stop thinking about. 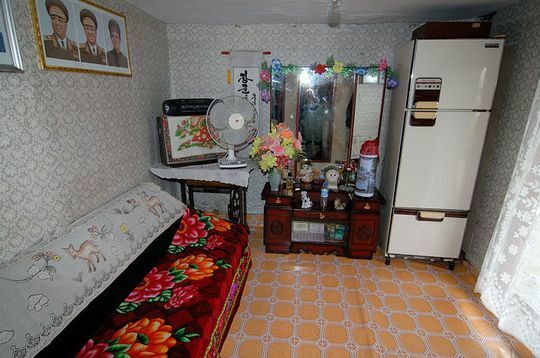 Notice the framed pictures of the leaders inside this North Korean home. When couples get married, they’re given framed pictures with a specific cloth that must be used only for thos This is the third book that I’ve read about North Korea. My favorite is still Nothing to Envy by Barbara Demick, and one that I highly recommend. “The Girl with Seven Names” is a close second. I could barely put this book down. It’s beautifully written, so moving, the type of book that you can’t stop thinking about. Notice the framed pictures of the leaders inside this North Korean home. When couples get married, they’re given framed pictures with a specific cloth that must be used only for those pictures. The pictures have to be placed at the highest spot in the home and cleaned regularly. Failure to do so and failure to take care of them properly, can lead to one’s being sent off to a labor camp. North Korea memoirs are always difficult. The stories of escape aren't yet so common as to be mundane (though perhaps we should hope for the day they are) but they're difficult to put into great prose. Hyeonseo Lee tells of a remarkable upbringing in that reclusive country, although in her border town people seem to cross into China and back with surprising ease. Her escape story and life in China testifies to her grit and intelligence. And the story of how she adopted seven different names in he North Korea memoirs are always difficult. The stories of escape aren't yet so common as to be mundane (though perhaps we should hope for the day they are) but they're difficult to put into great prose. Hyeonseo Lee tells of a remarkable upbringing in that reclusive country, although in her border town people seem to cross into China and back with surprising ease. Her escape story and life in China testifies to her grit and intelligence. And the story of how she adopted seven different names in her life, and what they all meant, is heartbreaking for those of us with more stable lives. And she's certainly written a compulsive page turner. The Girl with Seven Names is a powerful, fascinating true story about a young girl who manages to escape from North Korea. She gives a very honest view of living in North Korea and her escape and later helping her mother and brother escape. I found myself feeling all the pain, the struggles and the fear that Hyeonsea felt. It also reveals the difficulties, for young and old to assimilate into a new culture. This is an intriguing account of an amazing young women. "The girl with many names and no identity." Hyeonseo Lee was born in North Korea. In part because her parents held government jobs, she and her brother had a good life, all things considered. Except that Hyeonseo had a different name then and a different mindset, believing North Korea to be the greatest country in the world. A few weeks shy of turning eighteen, she decided to cross the border into China for a brief foray before she started college. Her brief foray turned into a ten year "The girl with many names and no identity." Hyeonseo Lee was born in North Korea. In part because her parents held government jobs, she and her brother had a good life, all things considered. Except that Hyeonseo had a different name then and a different mindset, believing North Korea to be the greatest country in the world. A few weeks shy of turning eighteen, she decided to cross the border into China for a brief foray before she started college. Her brief foray turned into a ten year venture as it became too dangerous for her to return. Having to relay on her wit, ultimately forging different identies, Hyeonseo had to learn to survive. I enjoy reading for many reasons. Reading can be fun and entertaining, enlightening and educational, and transport the reader to a different time and place altogether. But this book, in particular, makes me feel very, very blessed and thankful for my life. Hyeonseo had a fairly good upbringing. Because of her mother's smuggling business, she even enjoyed many goods and products that others did not have access to and did not lack basic neccessities. In addition to that, she had a good Songbun (the caste system of North Korea, she was ranked as loyal and therefore had choices). She was one of the lucky ones. Her house was located on the border with China and along the narrowest expanse of the river. Before her eighteenth birthday, Hyeonseo crossed into China for a brief visit. Little did she know that she was never coming back. In order to survive, she had to change names (several times) and try to blend in. If caught and sent back to North Korea, the consequences for her and her family were dire. This narrative is gripping, harrowing and intense, the desperation tangible. What stands out is Hyeonseo's fighting spirit. Everyone should read this book. Hyeonseo Lee grew up carefully cleaning picture frames for weekly inspections by government officials in white linen gloves. In her classroom and at her mother’s job, weekly meetings were conducted in which everyone in attendance had to confess their guilt about something and accuse others of the same. The leaders of her country were made heroes in fairy tales told by her kindergarten teachers. Those who did not cry enough when Kim Il-Sung died mysteriously disappeared. Even living on the border Hyeonseo Lee grew up carefully cleaning picture frames for weekly inspections by government officials in white linen gloves. In her classroom and at her mother’s job, weekly meetings were conducted in which everyone in attendance had to confess their guilt about something and accuse others of the same. The leaders of her country were made heroes in fairy tales told by her kindergarten teachers. Those who did not cry enough when Kim Il-Sung died mysteriously disappeared. Even living on the borderland between North Korea and China, where some Chinese channels could be picked up and hundreds of goods were smuggled into the country every day, the oppressive hand of the regime was constantly felt. When Lee is finally able to make a trip to the other side of the border at the age of 17, she tastes freedom, however skewed, for the first time, and she realizes she can never return home. This book was incredible. Lee’s journey was both harrowing and inspirational. To get a glimpse into one of the most secretive and oppressive countries in the world was incredibly valuable, and the experiences Lee recounts after her escape are incredible. The Girl with Seven Names, titled for the different names Lee had to adopt to avoid deportation while making a new life for herself, tells a fantastic story with a unique perspective. When she made her escape at 17, Lee was just hoping to spend a couple days in China before coming back home, afraid that if she waited until she was 18, the punishment if she were caught would be a lot harsher. However, after she arrived on the other side, she was told that it was not safe for her to return to her country ever again. Suddenly, all Lee had in the world were the clothes on her back, and she had to learn how to survive in a country that would instantly deport her if they knew where she was from. Coming from that kind of a mindset, being a rebellious teenager who didn’t have any motivation at the time to become a political refugee or human rights activist, created such an interesting perspective in this reading. Combined with the themes of survivalism and family duty, this book turned out to be quite a page turner. Excellent and much different than Escape from Camp 14 and other books which involved life in the prison camps. The author lived what many would have considered a fairly normal life in a North Korea border town with China. This story gives a picture of average life in North Korea, life for defectors in China, and life struggling with their new identity. Her family adds much drama to the story as well. A very good read to get a different perspective and to learn from Hyeonseo's incredible story. It was the story about woman who leave her country to satisfy her curiosity of the world. She can't go back because her country has a strict regulation that the people who leave will get a punishment when they go back. So she must take her own path in a new world live as an illegal settler and hide her identity as a North Korea citizen. She had go through a lot hardship in her way to get the freedom and had to change her names for a several times. She never know that it tooks a long way to final It was the story about woman who leave her country to satisfy her curiosity of the world. She can't go back because her country has a strict regulation that the people who leave will get a punishment when they go back. So she must take her own path in a new world live as an illegal settler and hide her identity as a North Korea citizen. She had go through a lot hardship in her way to get the freedom and had to change her names for a several times. She never know that it tooks a long way to finally meet with her family again. This is the most informative, interesting, and mind boggling memoir I've ever read. North Korea is a mysterious country that blocks out all foreign powers to strengthen its own dictatorship. This story gives insight into North Koreans' every day lives and the grueling process of escaping the hunger, the brutality, and the control. I'm actually appalled at how the surrounding Asian countries treated the defectors seeking asylum from a known dictatorship. I don't know if it's still like that today This is the most informative, interesting, and mind boggling memoir I've ever read. North Korea is a mysterious country that blocks out all foreign powers to strengthen its own dictatorship. This story gives insight into North Koreans' every day lives and the grueling process of escaping the hunger, the brutality, and the control. I'm actually appalled at how the surrounding Asian countries treated the defectors seeking asylum from a known dictatorship. I don't know if it's still like that today, but dear god! Pretty much everyone in the modern day world knows North Korea is ruled by a tyrant who doesn't feed or take care of his people, so when they finally manage to escape, we're just going to ship them back? That's completely inhumane. 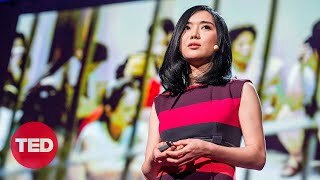 "Hyeonseo Lee brought the human consequences of global inaction on North Korea to the world's doorstep.... Against all odds she escaped, survived, and had the courage to speak out."